For trend no. 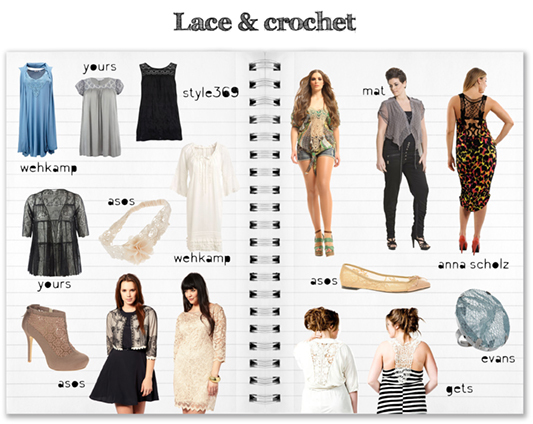 5 I picked some lace & crochet stuff for you. Lace can be very romantic or edgy when you style it right. Watch out with black and red lace. It can become trashy real soon! Just remember two things: never show too much cleavage and watch the lenght of the dress or skirt. Too short is a no go. Oh and never combine the 2 (that’s three I guess 😉 but that counts for almost every outfit!). Anyway, when you have lace in white or cream, then it doesn’t have the same effect. This colour gives you a romantic look and it’s nice to spice that up with high heels, denim or maybe a leather jacket. an outfit post for you.